The fun angle here is how the publication provides a comment function, how most of the comments are foaming over the embarrasing errors – and how there is absolutely no reaction from the magazine, even after one week. Web 1.899997, if you ask me….. This entry was posted in Humor on December 31, 2005 by Espen. The desirability of the United States as a place in which to locate economic activity is growing rapidly: the underlying engine of technological progress is spinning faster than it has in at least a generation. I see rising working- and middle-class incomes in America during the next generation generating what is in Friedman�s terms a virtuous, not a vicious, circle. This entry was posted in Academically speaking on December 28, 2005 by Espen. 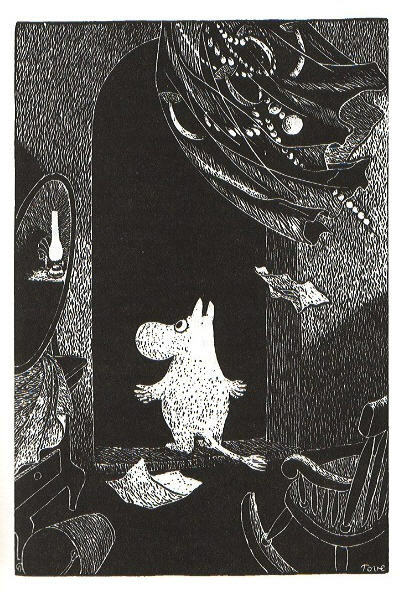 Political correctness hasn’t hit Norway quite as hard as the US, so I will take my chances wishing you all a Merry Christmas and a Happy New Year, offered here with a few pictures from Tove Jansson’s “Trollvinter“, perhaps the most beautiful book ever written about winter, alienation and friendship. Incidentally, don’t confuse this wonderful book with the latter cartoon characters – it bears the same. relationship to those as A.A. Milne’s Winnie the Pooh bears to Disney’s version. In Norway, Christmas starts early – for us, at least, on December 23 with the traditional “julegrøt” – rice porridge. In the porridge, eaten with sugar, cinnamon and an “eye” of butter, goes a few almonds – and the one who finds the most almonds gets a prize. Tomorrow, the 24th, is the big day, with a slow morning and, for the children, an even slower afternoon until (after church around 2pm) it is time for the big Christmas dinner. (Incidentally, I don’t go to church myself, so I have the house to myself and get to put on Swedish television with Disney’s Christmas – largely unchanged since the 1960s – prepare the potatoes and sample the wine until the family returns, which for me is the best possible start of Christmas.) After dinner, when the younger children are close to exploding from repressed anticipation, comes the unpacking of gifts – always done slowly, one gift after another – from under the Christmas tree. This takes a while, during which heaps of cakes, wine, and other goodies are consumed until everyone drifts off to sleep, to awake on Christmas morning to prepare for a late and very large breakfast. This entry was posted in Blogging on December 23, 2005 by Espen. Tony D. has some reflections to offer on GM’s current IT sourcing process – essentially saying that they are trying to copy BPX’s famous "divide and conquer" strategy without taking into consideration that the implementation part of that deal was a qualified success, at best. I wasn’t really surprised that BPX had had problems with their very creative deal, but confess to not having followed it after the initial story was published. Tony is the man on outsourcing deals: His article gives some idea on how complex such a decision really is, and how much the history of the corporation shapes the thinking. As Click and Clack once said, when you have had a very small car for a while, you get so frustrated that you err on the other side, getting a huge monster just to make up for all those years with a mailbox-on-wheels. I wonder if GM is doing something similar: Setting up a deal that will give them total power to squeeze their multiple outsourcers – a position that looks great when the contract is signed but turns out to be untenable in the long run. In an outsourcing relationship, you need to worry about the long-term economic health of your partners. There, too. This entry was posted in Offshored and out on December 23, 2005 by Espen. This entry was posted in Humor on December 20, 2005 by Espen. This entry is written from my mobile phone, a Sony Ericsson P910, using a ThinkOutside Stowaway bluetooth keyboard and Opera for mobiles. It is actually pretty simple – the keyboard is not as good as the one I used to have for my PalmPilot, but it is usable for a slow kind of almost-touch writing. Haven’t tried anything fancy such as links or pictures, but you have to crawl before you can leap. Anyway, blogging and surfing is now mobile for me – I can feel freedom from my laptop and 1.5 hour battery life approaching…. This entry was posted in Nerdy ruminations on December 19, 2005 by Espen.